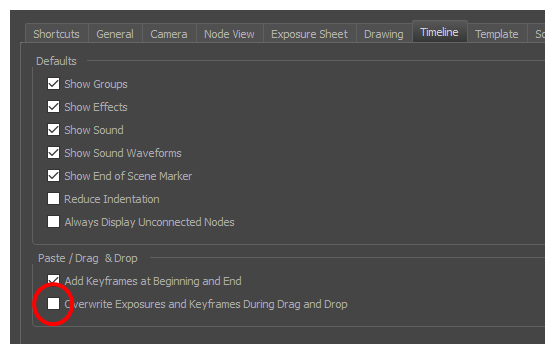 You can change the way the Timeline behaves when you drag and drop a selection of keyframes or drawings with the Overwrite Exposure and Keyframes during Drag and Drop preference. When this preference is enabled, dragging and dropping drawings and keyframes in the Timeline view will overwrite the drawings and keyframes between the selection and the destination, as if the selection "wiped" everything on the way to the destination. This behavior is more similar to the one observed when manipulating keyframes in Adobe Animate. If disabled, dragging and dropping a selection in the timeline will simply remove the keyframes and drawings from the source, and overwrite the destination with them, leaving anything else unaffected. You can set this mode in two places: the Timeline toolbar and the Preferences dialog box. From the top menu, open the Edit (Windows/Linux) or Harmony Advanced (macOS) menu and select Preferences. In the Timeline tab, check or uncheck the Overwrite Exposures and Keyframes During Drag and Drop option, then click OK. In the Paste / Drag & Drop panel, check or uncheck the Overwrite Exposures and Keyframes During Drag and Drop option. In the Timeline toolbar, click the Toggle Override Exposure and Keyframe During Drag and Drop button. Note that you may have to add this button to your toolbar by right-clicking on it and selecting Customize.